The field runs through Tamada, Yumesaki town after passing through the Yokozeki intersection of the prefectual road 67.Some people may be enchanted by the smell of the flowers and want to go jogging and walking, while other people simply take photos of the beautiful flowers. The planted area is 8 hectares or 800 meters by 800 meters. This means that it is about the size of a baseball stadium, or 605 Japanese houses. It’s hard to imagine such a big field, as it seems almost endless. The famous Japanese children’s song ‘Oborozukiyo’ (hazy moon night) contains the lines “I see fields of golden flowers, shining in the evening sun, above them misty mountains, beautiful, as the wind caress my eyes, and I gaze gently at the sky”. These lyrics might evoke an image of early spring similar to this field. Rapeseeds usually start blooming around the beginning of the late February. The Tatsuno rapeseed festival is held to celebrate this beautiful scene. The rapeseed flowers in Tamada are grown to coincide with the Himeji Castle Marathon which is held in the same month. Due to this timing, people taking part in Marathon have the opportunity to enjoy the beautiful flowers along the Tamada section of the course. The farmers try to grow the best flowers possible for the marathon by using high quality soil and fertilizer. In floriography -the language of flowers, rapeseed flowers represents ‘brightness’ and ‘spirit’. I hope that the marathon runners can harness their own spirit and brightness and break their own records. However although the flower blooms during Himeji Castle marathon every year, this year’s blossoms are predicted to be particularly nice. Despite this wonderful opportunity, please bear in mind that the field isn’t actually designed for tourists and there aren’t any toilet facilities or parking. I recommend using the Shinki bus to the Tamada or Yokozeki bus stop, after which is around a 10 minutes-walk to see the blossoms. Take a bus from the north of Himeji station to Tamada or Yokozeki. 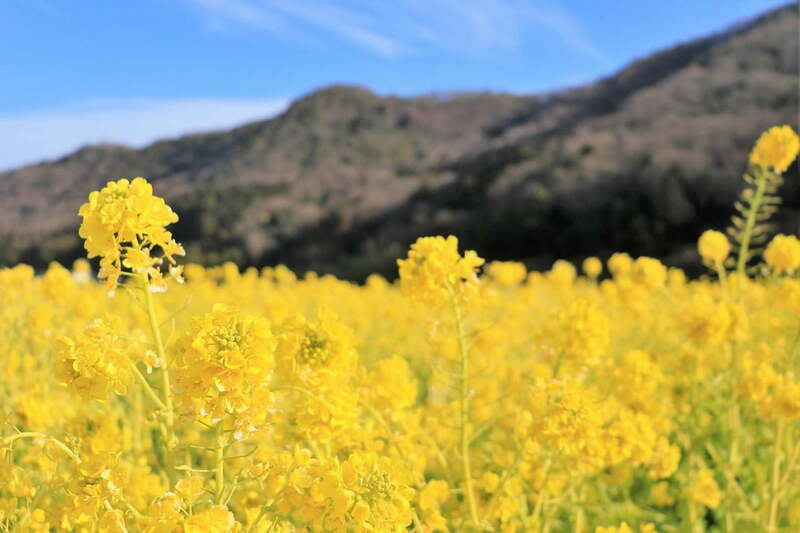 Click here to find the time table of bus to Tamada rapeseed flower field.